Take a really good look at this picture; you may just be looking at the very thing that will defeat cancer. The black dots are nanobots, practically delivering a killing blow to the cancerous cells, and only to those cells. 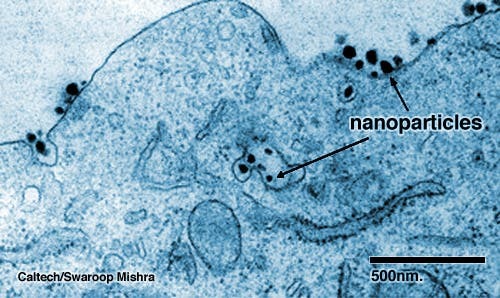 According to Mark Davis, head of the research team that created the nanobot anti-cancer army at the California Institute of Technology, the above mentioned technology “sneaks in, evades the immune system, delivers the siRNA, and the disassembled components exit out”. According to the study published in Nature, you can use as many of these nanobots as you wish, and they’ll keep on raiding and killing the cancerous cells and stoping tumours. The technology has its roots on RNA interference, a discovery that brought Andrew Fire and Craig Mello the Nobel Prize in 2006. This is just the first demonstration CalTech performed, but it went on perfectly, and the results are quite promising. We will hold our fingers crossed.